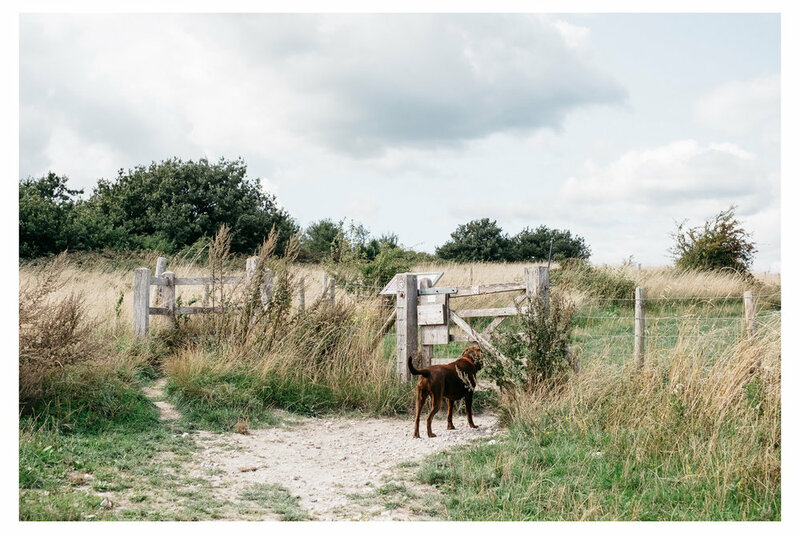 Monty and I walk variations of this walk at least 3 times a week, granted this is the longest version (unless we continued on to Ditchling or dropped down to Plumpton, but that's another post) but it's fair to say I know it very well. It never gets boring though - the wildlife changes, the landscapes varies in palette and it always looks different depending on how the hours light wants to portray it. If I was to move from the house we're in I think this would be the thing I miss the most about where I live. Something was holding me back from blogging it though, perhaps I wanted to do it justice or even try and get to grips with it. This is my third attempt at photographing this walk - the first time was in winter and while I love it the pictures lacked energy. Then another in the spring but met a block somehow - I suppose I was trying to capture it as best to show all the variations and was finding it hard to settle on just one but it got to a point where I just needed to get on with it. So here it is on a late August bank Saturday as the air turned autumnal and the foraging opportunity was high. You can see some snowy images here. This is approximately a 2.5 hour walk with some hills and, if wet, some mud too. There are options all along the route to turn around and go back, either on a circular or back on yourself. Even just Landport Bottom at the first part of the walk provides incredible views and is a half an hour walk if you want to kept snappy. It's a fairly slow incline up but will get your heart rate going and is a rewarding short walk. Livestock is present for some of the walk. No stiles on this one, just lots of gates. 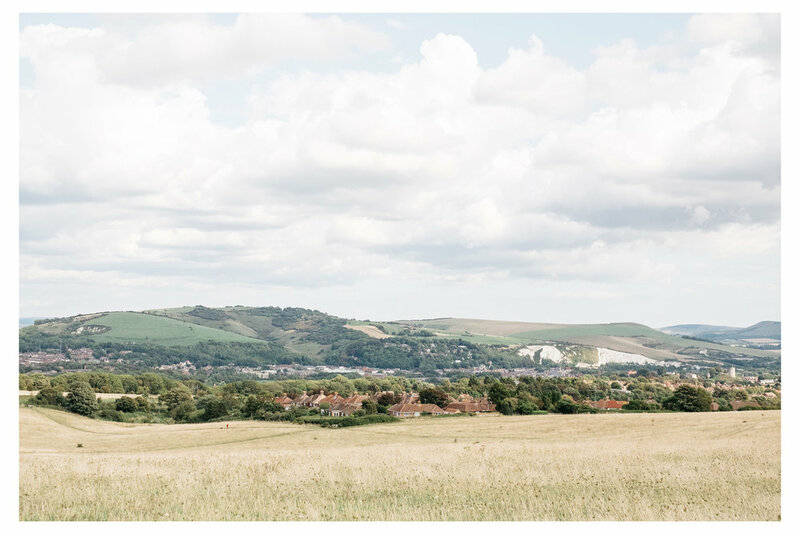 You're starting from Lewes prison - there is usually plentiful parking on The Gallops (first left on the A275 turning left at the prison crossroads coming from the A27) which is free at the weekends and super cheap in the week (£1.50 for a large portion of the day). Alternatively you can get the 28 or 29 bus from Brighton, timetables here. As I was editing the pictures I realised Monty (more specifically, Monty's bum) is showing you much of the way - what a helpful doggo! It's a hard one to get lost on as its fairly easy to navigate back to Landport Bottom which is a main part of this walk. Standing on the A275 with Spital Road behind you and the prison to your left you are heading up the track that takes you behind the prison. When you reach Heath Stables you need to take the path that forks off to the right and along by the railings. Here you can head on up and take the track between the dog poo bin and the house that sits in the corner of the street as it turns right. Keep on the track until you come to the gate and you're welcomed onto Landport Bottom with an information board which makes for interesting reading - this is the site of a battle with Simon De Montfort which formed the basis of the parliament we know today. Also, don't forget to look back here - you can see right over to Newhaven. You're going to continue along the top of this vast field - enjoying the views over Lewes and the wild flowers that grow along the fence. Halfway along you'll meet a dew pond which is nice for a stop on the bench if you are so inclined. Eventually you come to the racecourse (which looks a bit ominous!) and you are passing through the gate straight over the road (watch for cars here as they tend to go at speed!) and through another gate into another small field. Keep to this side of the field and before you get to the corner there is another gate to the left which you're going to take, along a track which passes to the right of paddocks and jumping fields. The track will start to narrow out and become gravel, before it gets to a fairly bumpy, sandy state. The foraging opportunities along this path are generous. After about 15 minutes you'll get to the Black Cap sign where you carry straight on through the gate. From here you take the 2 o'clock path to the beacon. 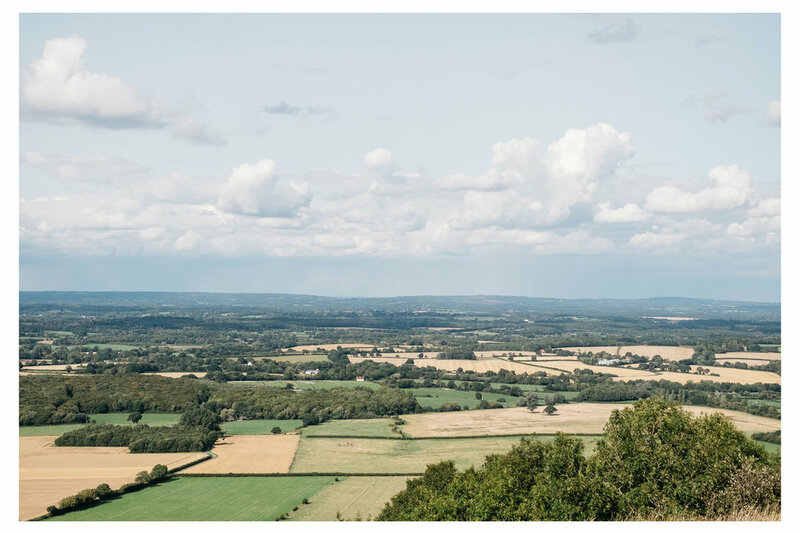 When you get to the beacon you'll get a pretty clear 360 view for which I recommend you to pause, resist taking your cameras out for a bit and just take in with some deep, cleansing breaths before you try and capture it. If you want to head to Blackcap turn left here and you'll be coming back on yourself to return. You'll know you've got to Blackcap as you'll see the monument. Otherwise, take a right and head along to start your small descent back to Lewes. Keep to the path that runs along the top of the hill and you'll come to a gate which leads you into a sheep field. Keep following the clear path, under the pylon wires and to the narrow path with the trees on the left and the fence on the right. You'll pass through a few more gates on this narrow path before you get to an option to turn right up a track or left into the woods. We're venturing left at the footpath marker and then immediately right through the woods. Enjoy the oxygen these wonders are dumping into the air and take a right just after you pass through the gate with the slightly creepy display on the gate post! 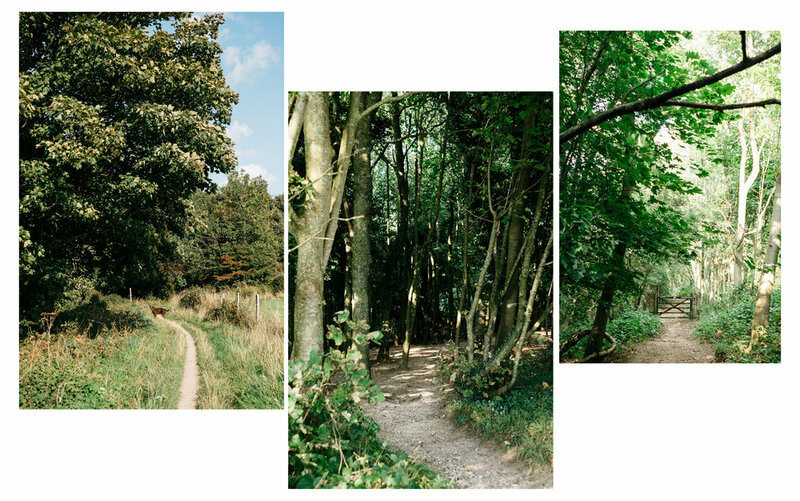 After you have climbed a small hill turn left to walk along with the fence to your right - you'll pass through another bit of woodland and another gate (ignoring the style to your right) will soon come to a t-junction where there is a stoney path running left and right. 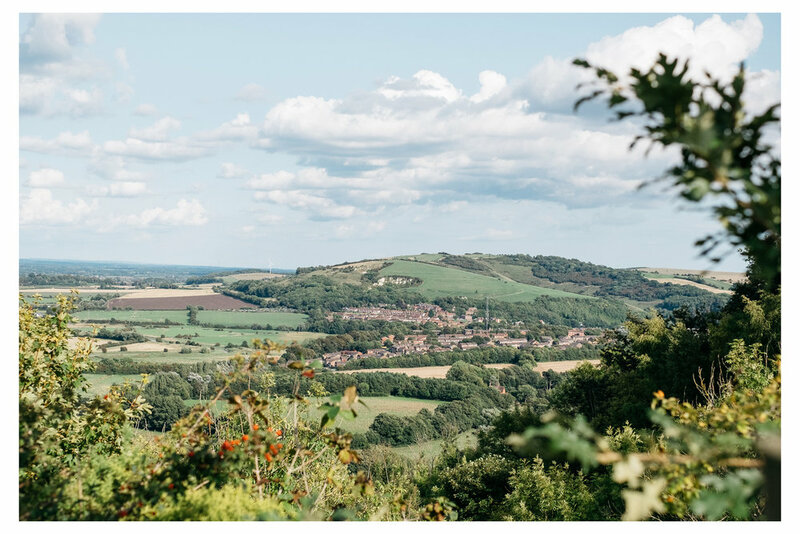 Take a right (with the fence running to your left) and soon you will catch sight of one of my favourite views of Lewes - over Offham, the snaking river Ouse and the old Chalk Pit. Enjoy each opening in the hedgerows here as each one brings a different view. When you get to the gate turn right after passing through and head through another gate that opens up onto a field - there is a style to your right but you are heading along the top of the field until you can turn along the grass at approximately 10'o'clock to a gate about 2/3rds along the far side of the field. You are crossing back over the road that leads to the racecourse back into Landport Bottom. Take the trodden path over to the corner gate that will bring you to the housing estate - you will now have this estate on your left all the way back to Lewes as you head straight along the fenced path until you come to the very far corner. In this corner you'll find another little gate and a path will wind back to the track you started on. Head back down towards the prison and you're now due a very well deserved Lewes pint! As you are this end of Lewes, there can be no other than The Pelham Arms - they have their own brewery as well as a great selection of drinks and the food is all locally sourced and cooked with a whole lot of love.